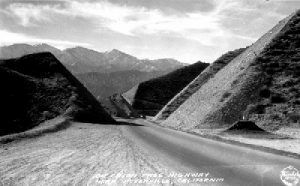 Cajon Pass, which separates the San Gabriel Mountains from the San Bernardino Mountains, was once the only gateway negotiable by wagon trains. It was here that the Mojave Trail, the Mormon Trail, and the Spanish Trail converged. Along this old path traveled history’s Indians, trappers, explorers and scouts on their way to what would become the San Bernardino Valley. The first paved highway was built over the pass in 1916 and was upgraded several times until the highway was replaced by I-15 in 1969. 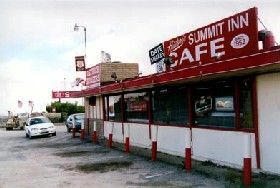 At the top of the pass at the Oak Hill exit was the historic Cajon Summit Inn, a Route 66 landmark serving customers since 1952 and one of the few survivors along this stretch of highway. Tragically, the Summit Inn burned to the ground during a California wildfire on August 16, 2016. As you travel down the pass, keep your eyes open for “ghosts” of the old road, including a vintage “Eat” sign peeking from the roadside foliage, crumbling cabins, and pieces of the original pavement. Soon, you enter the historic San Bernardino Valley. 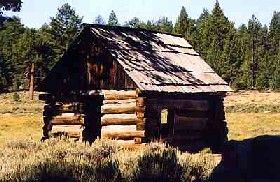 Spanish missionaries were the first to settle in the area in the early 1800’s, building an outpost for other missionaries who traveled the California territory preaching to the Indians. The two tribes that inhabited the valley for as many as 4000 years before the Spanish arrived were the Serrano and the Cahullia Indians. The first mission was established on May 20, 1810 and was named “San Bernardino” after the patron saint of the day on the Catholic Calendar. The missionaries also taught the Indians how to plant and irrigate crops and the valley began to flourish. Another mission – the Asistencia, was built in 1830 but was looted by attacking Indians in 1834 and passed into private hands. This property has been restored and can still be seen today on Barton Road in the suburbs of Redlands. The mission era came to an end in 1834 when California’s Mexican Territorial Governor Figeroa ordered them closed. Soon, the abandoned mission became an important post on the trading route known as the Spanish Trail, where people such as Kit Carson and Jebediah Strong made frequent stops. Spanish landowners built haciendas and ranchos in the area as it began to grow. However, the desert Indians began to steal the herds of cattle and many of the ranchers gave up and moved out of the area. The cattle rustling continued until nearly 500 Mormons arrived in the valley in 1851. Purchasing the 40,000-acre San Bernardino Rancho to settle on, they built a stockade and named it Fort San Bernardino to protect themselves from the Indian raids. However, because they weren’t raising cattle or horses, the desert Indians mostly left them alone and soon families began to move beyond the stockade. By the time the City of San Bernardino was officially incorporated in 1854, the community had a population of approximately 1,200. In 1860, gold was discovered in Holcomb Valley by a man named William F. Holcomb who filed five gold claims. Soon, men began to pour into the mountains surrounding San Bernardino in search of their fortunes. In no time at all there were thousands of miners combing the area in search of the precious metal. The mining settlement of Belleville, in Holcomb Valley became the largest city in Southern California and almost took the county seat away from San Bernardino. Holcomb Valley was the largest gold find in Southern California and to this day, it is said that the main gold “vein” has yet to be discovered. Today, the one time prosperous city of Belleville is a ghost town. In 1885, the Santa Fe Railroad completed its line through the Cajon Pass to San Bernardino, with its first depot located in a boxcar. Soon, the Union Pacific and the Southern Railroad had also converged on the city, making the town an important trade center. With the ease of the railroads, more people settled in the town and by 1900, it was called home to more than 6,000 residents. By the early 1900’s farmers had found the rich fertile ground of the valley to be ideal for planting oranges and soon groves of the tropical fruit spread across the landscape from the mountains to the coastal plains. 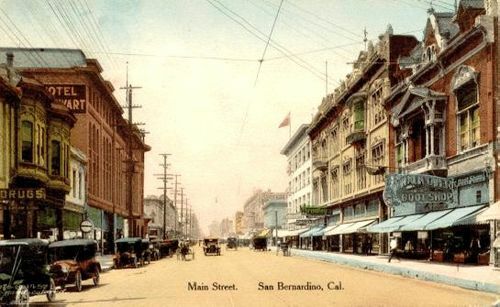 By 1910, the population of San Bernardino had doubled to more than 12,000 residents. 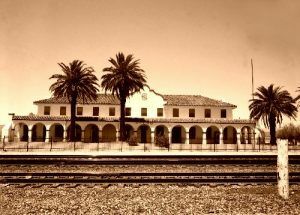 Having been chosen as the headquarters the Santa Fe Railroad’s Pacific Coast Locomotive Works, a grand new depot was completed In 1918. Designed in the Mission Revival style, the magnificent structure served as both a passenger transportation center as well as the railroad’s administrative offices. The opulent structure, complete with polished tile walls and floors, also included dining areas, a telegraph office and a Western Union office. Just a few years later, the depot was expanded to make room for a Harvey House Restaurant, which opened in 1921. Neatly dressed in starched black uniforms with crisp white bibbed aprons and starched white caps, the Harvey Girls began to serve hot meals, bakery goods and strong coffee to travelers and locals alike. In 1926, Route 66 was completed through San Bernardino and the town quickly responded with motels, gas stations and other services for the many travelers, several of which can still be seen today. Unfortunately, due to the many new automobile travelers, rail travel began to decline and by the 1950’s the Harvey House Restaurant was closed. Before long, the historic depot began to fall into disrepair. However, in the mid-1990’s, the San Bernardino Associated Governments and the City of San Bernardino began to work together to bring the depot back to life. Today, it has been fully restored and serves the Metrolink, a commuter rail service, Amtrak, and the offices of the San Bernardino Associated Governments. As San Bernardino continued to grow into the large metropolitan city that it is today, many other treasures from the past were also preserved. There were two alignments of the Mother Road through San Bernardino, the latter one now called Business 66. Here you can see the first McDonalds Restaurant, which now houses the McDonalds Route 66 Museum at 14th and E Streets. Also along this route is the California Theatre of Performing Arts, a landmark since 1928, and the place of Will Rogers’s last performance. The theatre now displays a mural of Mr. Rogers. Along the older alignment, several motels and cafes can be found tucked between the newer buildings, one of which is the Mitla Café at 602 N. Mt. Vernon Avenue. Established in 1937, this historic restaurant is a family owned business that’s been serving up great Mexican cuisine since the early days of Route 66. While in the San Bernardino area, you will surely notice the well-known natural landmark of the Arrowhead that sits high on the mountainside. Clearly visible long before white settlers came to the area; the phenomenon was created by the natural uplifting of the soil and can be seen from as far away as 30 miles on a clear day. Many legends surround the Arrowhead, but the most popular is an Indian story that the Great Spirit created the arrow to guide them to where they were to live. The Arrowhead, measuring 1,360 feet long and 450 feet wide was once believed to be man-made, so perfect are its proportions. Beyond San Bernardino, Route 66 fades into the suburbs of Rialto, Rancho Cucamonga, Upland, and several others before reaching the city of Pasadena, where you will know you have reached the Los Angeles sprawl.